I picked up a new die set last week at Tuesday Morning, called Twit Twoo by Die’sire. Kind of a goofy name for a die, but you can use the shapes included in the set to create a pretty cute little owl card. A new challenge is being shared today on the Impression Obsession Blog, and I hope you join the fun! We are popping up words for this week’s challenge. Pull out your Impression Obsession stamps and/or dies, and join us! To create my card, I used several dies. I glued the birch trees behind a circle opening cut in my card base, and adhered leaves that I cut from white card stock and colored with markers. I die cut Give Thanks four times and adhered them together in a single stack to give the words lots of dimension. 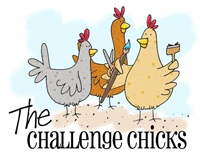 Now, get ready for a wonderful dose of inspiration and check out what the other team members created for the challenge. Played with some Taylored Expressions stamps and dies tonight - used my favorite Happy Hens, and Lookin’ Sharp to create this card. 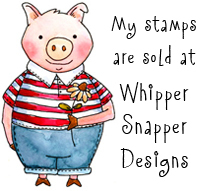 Images are stamped on white card stock and colored with alcohol markers. I added some stardust Stickles for a bit of sparkle and shine. Good day to ya! 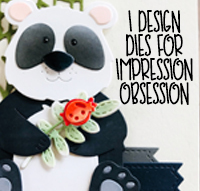 I am this week’s featured designer for Impression Obsession. I chose to create a garden themed thank you card, using a few images from the Lavender Fields (CL850) set, a butterfly from the Butterfly Kisses (CL853) set, and a sentiment from the Thanks Sentiments (CL41) set. I stamped the images on watercolor paper using VersaMark ink, and embossed them with black detail embossing powder. Once the embossing powder was set, I spritzed the paper with water and added various colors of Distress Ink to loosely paint the image. I added a couple of buttons tied with natural twine for extra embellishment next to the sentiment banner. Visit the Impression Obsession Blog for lots more inspiration and hosted challenges! A new challenge is being shared today on the Impression Obsession Blog, and I hope you join the fun! The challenge is It’s a Guy Thing (masculine cards). Pull out your Impression Obsession stamps and/or dies, and join us! To create my scene card, I used several dies and the Perfect Day sentiment B13623. Dies: Mountain Landscape Layers DIE347-W, Fir Trees DIE084-V, and All-in-One Frames Rectangle DIE291-WW.